Nashville's full service nursery and landscape supply company. We serve the wholesale and retail markets with a full line of products including plants, mulches, topsoil, soil mixes, seed, fertilizers, wall block, pavers, crossties and a limited line of rental equipment. We offer convenient pickup or delivery service. Monday through Friday - 7:00 a.m. to 4:00 p.m.
For more information about bioretention soils and ordering custom soil mixes from Nashville Nursery, contact Randy Leeman. 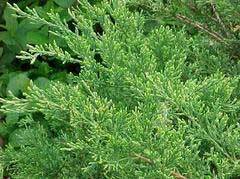 This juniper cultivar is a compact, evergreen shrub with a fountain-like, arching habit, perfect as a foundation plant, hedge, or specimen. Typically grows 4-6’ high and to 8’ wide. Features dark green foliage (may turn darker in winter) which is attractive year-round. Easily grown in average, medium, well-drained soils in full sun. Also tolerant of many city air pollutants and some drought. Intolerant of wet soils.